What has Walsingham to say today to the people of England and beyond? We believe that Walsingham’s full message has yet to be discovered. Pope Leo XIII famously predicted that when England returns to Walsingham, Mary will return to England and we are sure that when this happens the country will experience a reflourishing of Christianity in these Isles. To Jesus through Mary has been a common phrase used by countless saints and ordinary people down through the ages. It is Mary who will teach us to be authentic disciples of Jesus. As she is presented to us in St Luke’s gospel, Mary stands for the perfect disciple. Like Israel of old she is chosen and called simply out of love. She has not chosen God; rather God has chosen her and this applies also to us. Do I really believe that I am loved unconditionally by God? That I am his beloved? Do I believe deep down that I am chosen by him for a special mission that no one else can accomplish? 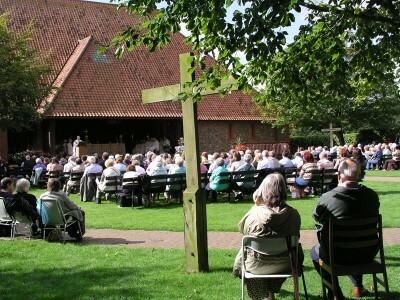 Walsingham has been and will need to be evermore in the future a place where people can come for healing at every level: physical, emotional, psychological and spiritual. Recently Todays broken society means that many will need to find such healing before they can even begin to hear God’s voice and recognise his call in this digital world of ours. In my own life I remember having to stop overnight in Las Vegas so as to visit the Grand Canyon. It was part of a round the world trip that my parents gave me as a present for having graduated at university. On this journey I didn’t go back-packing but stayed in comfort at the Hilton, Sheraton and Intercontinental chains of hotels. In the hotel at Las Vegas I remember that we needed to pass the casinos on going to our bedroom or to the restaurants. There was no avoiding them. These large halls had no windows or clocks. Why? To prevent people realising what time of the day or night it was and to keep them hooked into gambling once they’d started. It left a lasting impression on me in my early twenties seeing people so disconnected from the reality of time. What is preventing me from recognising the reality of God’s presence in my daily life? Where do I need healing? We see at the heart of Walsingham a specific woman, Mary who was asked to listen, to love and to bear life. As I experience God’s healing in my life I will be able to hear Gods’ call and respond to his love by making loving choices. Love received becomes love given. Mary had to be open to human growth and development. She had to make choices, accept responsibility, and ultimately let her Son go his own way even when she did not understand. This kind of trust implies a readiness to venture into the unknown, secure in a love that is greater than oneself and one’s own limited plans. Our community aims to help promote a vocational culture in the church and in contemporary society by supporting everyone’s growth in freedom so that they can follow their unique call in life. Walsingham could become a major vocational centre helping young people make initial life choices and helping all people live fully the call to life and love in their particular vocations. As we make small choices well each day we will make larger choices eg state of life/careers/relationships. Working as a palliative care for several years in London I noticed how many people here die alone and with many regrets for choices made during their lives. Instead, on the aforementioned trip, I also stopped off in Calcutta to visit Mother Theresa’s sisters (I had been discerning a vocation with them at the time). I was able to visit Kalighat, the Home for the sick, destitute and dying and I shall never forget the smile that a young girl gave me as she was being fed by one of the sisters. She was in peace experiencing these little acts of kindness although she had been picked up from the streets just a few days earlier. I thought that she was about 9 years old – instead I found out that she was 14 and her slight appearance was due to malnourishment. She died two days later. Her death was in stark contrast to many I have witnessed here in the West, both in Italy and in England. Yes, the choices we make today determine who we become tomorrow and the way we live today determines the way we will die. When this happens God is born in our hearts, Christianity becomes truly incarnational and Christians can transform society. Otherwise we, claiming to be Christians, will continue to live by non-gospel values. Do I really want to become a saint? And face the change necessary for my heart to be purified and transformed? Cardinal Newman famously said that ‘to live is to change and to become perfect is to change often’. Transformed hearts will be the source of real and effective ecumenical, interfaith, pro-family and pro-life work. It is what each of us is asked to do in our turn as we try to listen to what God is asking of us here and now, so that we may also love God and bear Jesus for the world in and through our own particular calling, whatever that may be. True joy will only be found in the realisation that each of us can reach the fullness of life by following God’s call to love and serve, wherever we find ourselves. Ultimately it is not important what state of life we are in, what we are called to ‘do’ or what task we are given or asked to do, who we are called to live with, but our relationship with God and how that unfolds, who we are and how we have lived by love. Then we can truly become a song of praise and thanksgiving to the Glory of the Trinity.